It’s Monday morning, the warmth of the sun brings a smile to your face as you unlock the doors and open up for the day. Twenty minutes later, it starts. One employee called in sick. Another is a no show, for the fifth time in 30 days. Your top customer just put in a rush order to be complete at the end of the day. You feel your blood pressure increase. The tasks are mounting and you’re overwhelmed. Thirty minutes later the mortgage company calls, your late on your loan payment. You have not completed anything as a customer just came in to complain about the last job you completed. You’ve reached a boiling point and you lose it! The employees that are there come to see the commotion. Your meltdown is a viral sensation and your competition is reaping the benefits. Leadership requires a heightened level of self-control. The Law of Self-Control says that what you feel leads to thoughts. Those thoughts lead to actions, which lead to results. To be a great leader, you must first master the Law of Self-Control. One roadblock to master self-control is stress. In these times of rapid change, stress is rampant. This is particularly true for those charged with the responsibility of leadership. There are seven major causes of stress. Worry: It fogs the mind and can depress the immune system, thereby threatening both your mental and physical health. Your ability to eliminate worry is the starting point for managing stress. Lack of Meaning: The second major source of stress is the lack of meaning and purpose in your life—no lofty goals to which you are committed. The “Incomplete Action”: A job not done, a task not completed, a responsibility not fully discharged, can be a source of enormous stress. Most often, the “incomplete action” is a result of procrastination. Fear of Failure: In moderation, fear of failure is healthy. It causes you to be prudent, take the time to objectively assess risks and make appropriate judgments based on your analysis. But when it crosses the line between healthy and unhealthy, fear of failure leads to indecisiveness, anxiety and worry, i.e. stress. Fear of Rejection: The fifth major cause of stress is the fear of rejection, which manifests itself as a need for the approval of others. Denial: The refusal to acknowledge and face an unpleasant reality. 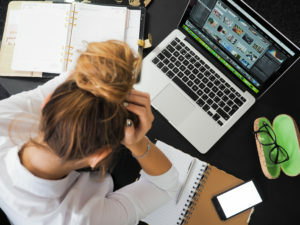 Denial often occurs when some part of your life — or your business—is not working, or when you have made a serious mistake, or perhaps have failed at an important undertaking, and you do not want to admit it. Anger: More specifically, uncontrolled anger. This negative emotion can destroy mental and physical health and ruin relationships. It’s important to acknowledge that anger comes from within you, not from without. Anger’s a response that you choose, even though the choice may be totally subconscious. While you cannot control other people or some circumstances in your life, you can control how you respond to them. Men and women who squarely confront their challenges and difficulties experience far less stress than those who avoid them. They are healthier, both mentally and physically, more confident and more self-reliant, and are far better equipped to take on the responsibilities of leadership. Learning the Law of Self-Control starts with the ability to manage the inevitable stresses of life. If you have questions on managing the inevitable stresses in business and life, just let me know.